D.X. Ferris had questions he was seeking answers to about American rock musician Donnie Iris and his career. So, he did what any good journalist would do and started asking the questions in hopes that others would want to know the answers to them, too. 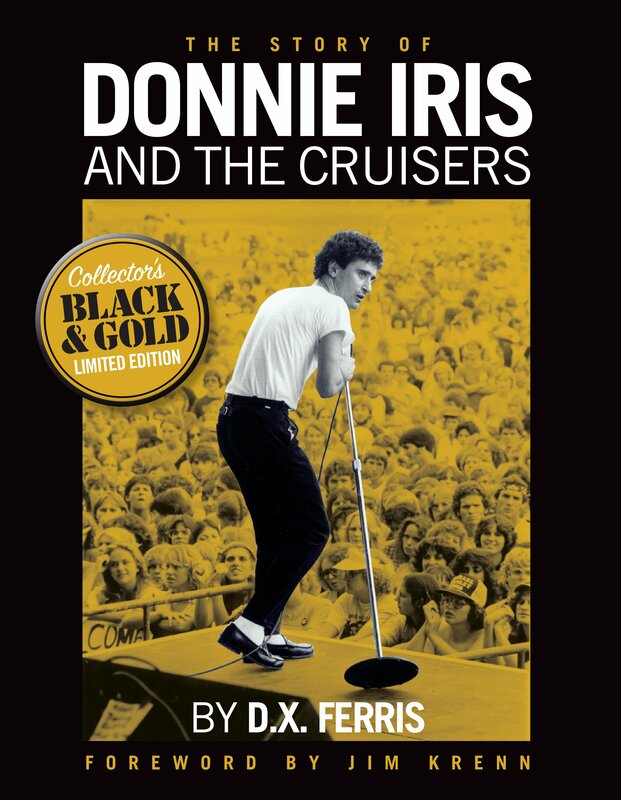 In his book, out this month, “The Story of Donnie Iris and the Cruisers,” D.X. lays out the answers in a unique, easy to digest way. We had a chance to chat with D.X. about everything from the book’s inception to the stories within, and the important lessons he learned along the way. Devon Anderson: As a fan of music and knowing about musicians’ lives, I like this book. What did you learn through writing? D.X. Ferris: In my life as a music fan, I have long been an evangelist for Donnie Iris & the Cruisers. My work as a rock critic/journalist is an extension of my life as a music fan: I’m always sharing music with people. In a perfect world, I think the Cruisers would have been competing against Cheap Trick, Elvis Costello, Huey Lewis, and the Pretenders for slots in the Billboard Top Ten. But the farther you get from my hometown, Pittsburgh, the less people are aware of the band. But Northeast Ohio, which I love and respect, is as much the Cruisers’ hometown as Pittsburgh is. So, people here get it. Still, fans tend to think Donnie and the Cruisers were either gigantic — or they were a one-hit wonder. The truth is somewhere in the middle. When you play their best material for serious music fans, nine out of ten of them say, “These guys should have been HUGE!” And I agree. So, my central question going in was, “Why aren’t they bigger?” Now that I’m done with the book, not only did I unearth some answers, but my perspective shifted: I still think they should have been bigger, but I’m duly impressed by how big they managed to become, on their own terms, working with limited resources. As a writer, my question is never, “Gee, what was THAT like? !” My question is usually, essentially, “How did you do that?” I’m always curious about how people become successful and achieve. I always want to know how people get in the game and stay there. So, I learned how Donnie Iris’ career happened. It’s a very complicated story that isn’t just your typical band narrative where they meet in a club, slug their way across the scene, develop a following, and Make It Big. It’s a much more intricate, nuanced, non-linear story. DA: What made you decide to go as in depth as you did? And I get it. Most of the writers didn’t have a lot of space to work with. And this is an official book with the band. So, at a certain point, we realized that this was a unique opportunity to document Donnie’s epic career — how Donnie kept his head above water for what I say in the book, to borrow a phrase from Jay Mohr & Martin Short, is “50 years in the show business middle class.” This was our one crack at it. That said, I realize it’s a lot of detail. So, I made it a modular read. That’s why the book has 75 chapters, each with a clear title — no clever references to song titles, that kind of thing. If you want to know about “Ah! Leah!” or the Fortune 410 tour, they’re easy to find. If you don’t want to read about Poletown and the songs bandleader Mark Avsec wrote for Bon Jovi and Carlos Santana, those parts are early to skip. DA: Some may consider this a niche publication – one directed only to the fans of the artist and music discussed in it. What makes this book something that can appeal, really, to lovers of all music across all genres? D.X. : It is a niche subject, but despite its unique meanderings, it’s an archetypal story that’s about more than just music. Donnie and his band are like people who were great high school athletes, then had a respectable career in Division II schools, and maybe played four years for a pro team before they got cut. Donnie and the Cruisers are super talents who accomplished a lot, and they made it way further than everybody they started out with. But, THEN, what do you do when your run ends? It’s a story about people who had amazing talent and worked their butts off to maximize how much they could do with it. Most people don’t have superhuman gifts like Steven Tyler and John Lennon. Most of us have to grind it out like Donnie and the Cruisers have. DA: Let’s discuss the size. This isn’t a beach read. When laying it out, was this a cognizant effort or did it flow and fill itself out organically? D.X. : I try to make books that are useful and useable. I think it CAN be a beach read, actually — and sorry to “actually” you. I tried to write it in a way that lets the reader pick it up, digest a brief story about one aspect of Donnie’s career, put it down, and come back to it. Sometimes, I’ll be reading a book about one of my favorite bands, and the chapters are all 40 or 50 pages long. And at a certain point, in the middle of a chapter about one of my favorite albums, I’ll throw the book across the room and never resume reading it. It’s harder to write short pieces than long ones. As a writer, I think you should keep the audience in mind: How can you make a book detailed and accessible? I always say that real communication is organizing information: In this case, organizing 50 years of details from Donnie’s life meant short chapters, a table of contents with clear chapter titles, an explanation at the beginning of the book, a straightforward chronological approach, and an index at the end. I don’t write to show off to my 12 writer friends. I write to share information with people, some of whom might not want to read endless boring chapters. Beginning-middle-end. Next. A writer should consider the audience, and not just type until you’re exhausted and say, “OK, that’s good enough. I’m tired of sitting here in the room alone. Take the book now. It’s all in there, somewhere, if you read the entire thing.” Realistically, most people won’t read the whole thing. You don’t drop a 200-page report in your boss’s lap and say, “It’s all in there, man.” Not if you want him to read your report. And the readers are the boss. They’re ones who will buy you book and tell their aunt who loved the Jaggerz that she needs to read it. DA: What do you hope the readers take away from your book? D.X. : Donnie and the Cruisers are the best-kept secret from 1980s FM radio — which, in retrospect, was the high-water mark of rock music as authentic mass culture. The book doesn’t claim the Cruisers are on a level with Van Halen… but they are a group with a lot to offer, and they’re ripe for discovery — if not rediscovery — because they don’t make ’em like this anymore. And even their biggest fans don’t realize how fan the band members’ careers reach. So now it’s all there, from Jonah Koslen to Kiss. And even though the music business is very different in the 21st century, I think Donnie’s career serves as a good road map on how to navigate a tough path to success, do it with integrity, perform on your own terms, and not sacrifice your friends and family along the way. And, if you pay attention, there’s a lot about how to make a good record. And we need more of those. The Cruisers are a longrunning partnership between a Slovenian, classically-trained Ohio state champion accordionist (Mark Avsec) and an Italian soul singer from Pittsburgh (Donnie). If those two guys can find literal and figurative harmony over a four-decade career, maybe there’s hope for the rest of us.